UNITED NATIONS, Sep 15 2009 (IPS) - A four-member United Nations fact-finding mission, which has just concluded an investigation into last year's brutal conflict in Gaza, makes a strong case for war crimes charges against Israel for its unrelenting 22-day military attacks on Palestinians, largely civilians, including women and children. The charges stem mostly from serious violations of international human rights and humanitarian law. 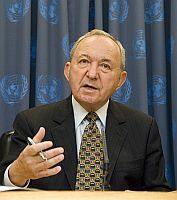 The U.N. team, lead by Justice Richard Goldstone, says there is also evidence that Palestinian armed groups, specifically Hamas, committed war crimes in their repeated mortar attacks on civilians on southern Israel. But its strongest indictment is against the state of Israel which is accused of imposing a blockade on Gaza "amounting to collective punishment" carried out as part of a "systematic policy of progressive isolation and deprivation of the Gaza Strip". The number of Palestinians killed during the conflict is estimated at between 1,387 and 1,417, compared with three Israeli fatal casualties in southern Israel and 10 soldiers killed during the fighting, four of whom died as a result of friendly fire. During the ruthless military operation, code-named 'Operation Cast Lead,' the Israelis destroyed houses, factories, wells, schools, hospitals, police stations and other public buildings. "Families are still living amid the rubble of their former homes after the attacks ended, as reconstruction has been impossible due to the continuing blockade (of Gaza by Israel)," says the 574-report released Tuesday. The study points out that Israeli acts that deprive Palestinians of their means of subsistence, employment, housing, water – and also denying their freedom of movement and their right to leave and enter their own country – could lead a competent court to find that the crime of persecution, a crime against humanity, has been committed. At a press conference Tuesday, Goldstone told reporters the Israeli government had not carried out any credible investigations into alleged violations. He said the U.N. team has recommended that the 15-member Security Council require Israel to report to it, within the next six months, on investigations and prosecutions it should carry out with regard to the violations cited in the report. The team has also recommended that the Security Council should set up its own body of independent experts to report to it on the progress of the Israeli investigations and prosecutions. "If the expert's reports do not indicate within six months that good faith, independent proceedings are taking place, the Security Council should refer the situation in Gaza to the Prosecutor in the International Criminal Court (ICC)." The team has also recommended that the same expert body report to the Security Council on proceedings undertaken by the relevant Gaza authorities with regard to the crimes committed by the Palestinian side. If there is no good faith and independent proceedings, the Council should refer this as well to the ICC prosecutor. Asked whether a highly partisan Security Council will agree to the proposals, Goldstone told reporters: "I would be disappointed if any permanent member of the Security Council (the United States, Britain, France, China and Russia) would object to such a resolution." Nadia Hijab, a senior fellow at the Washington-based Institute for Palestine Studies, told IPS that the findings of the Goldstone report "will send shivers up many spines". "It is going to be hard to ignore because of the seriousness of its accusations, the breadth of its coverage, and its even-handedness," she added. Hijab said the U.N. team also appears to have found a way to give its recommendations some teeth, with its call on the Security Council to refer the situation to the ICC – if Israel as well as Hamas do not undertake meaningful investigations and prosecutions of those responsible for war crimes that are independently monitored. While the report is even-handed in assigning responsibility, she pointed out, Israel is clearly assigned far greater responsibility. "This recognises its role as a United Nations member state and signatory to international conventions as well as the enormity of the damage it inflicted," Hijab said. For example, she said, the Goldstone team has recommended that the 192-member General Assembly set up an escrow fund so that Israel can compensate the Palestinians of Gaza. "The R-word of reparations is bad news for Israel and could set a precedent for future claims," she added. In addition, the report addresses the numerous human rights violations by Israel during its 42-year occupation, calling on it to end its siege of Gaza, lift restrictions on Palestinian freedom of movement, free Palestinian prisoners highlighting child prisoners and legislative council members, among others. "We may be witnessing the beginning of the end of the era of impunity," said Hijab. Donatella Rovera, who headed Amnesty International's own investigation into the conflict, said: "The responsibility now lies with the international community, notably the U.N. Security Council, as the U.N.'s most powerful body, to take decisive action to ensure accountability for the perpetrators and justice for the victims." She concurred with the recommendation that the Security Council refer the findings to the ICC prosecutor, if Israel and Hamas do not carry out credible investigations within a set, limited period. The findings in the U.N. report are consistent with those of Amnesty International's own field investigation into the 22-day conflict. Most of the Palestinians killed by Israeli forces were unarmed civilians, including some 300 children, AI said, in a statement released Tuesday. Palestinian rocket attacks killed three Israeli civilians and six soldiers (four other soldiers were killed by their own side in friendly fire incidents). "Israeli forces also carried out wanton and wholesale destruction in Gaza, leaving entire neighbourhoods in ruin, and used Palestinians as human shields," the London-based organisation said. Besides Goldstone, a former prosecutor of the International Criminal Tribunals of the former Yugoslavia and Rwanda, the U.N. team comprised Christine Chinkin, professor of international law at the London School of Economics and Political Science; Hina Jilani, advocate of the Supreme Court of Pakistan and a member of the International Commission of Inquiry on Darfur; and Colonel Desmond Travers, a former officer in Ireland's Defence Forces and a member of the Board of Directors of the Institute for International Criminal Investigations.